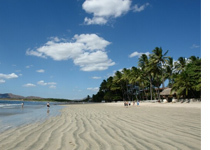 Written by Isabella Anderson Tamarindo Beach is one of the most popular beaches in Costa Rica. Known worldwide for its scenic beauty, with yellow sand and warm water, it is located in the district of Tamarindo, in Santa Cruz, Guanacaste, 150 miles from San Jose and 50 miles from Liberia. It is an old fishing town with Geographic and weather conditions perfect for practicing surf and sea Sports. The average temperature is 85F and the weather is dry from November till April, with a rainy period during the rest of the year, having sporadic rains usually in the afternoons. Tamarindo Beach is one of the top adventure tours and some of the best small luxury hotels them located in Tamarindo has excellent waves for surfing, with clear water and strong currents. Famous spots for advanced surfers are the legendary Roca Bruja; the amazing Grande Beach, and the spectacular El Estero, a river mouth break, where waves can get up to 12 feet during the end of the year. You don’t have to be expert practicing surf; there are great learning spots across the beach breaks. Tamarindo beach is the ideal place for Surfing in Costa Rica. You can enjoy other activities in Tamarindo, for example: fishing, sailing, diving, snorkeling, hiking, horseback riding, bicycling, ATV tours, and golf are some of these activities. You can plan trips to the cloud forests and volcanoes nearby and enjoy the breathtaking views. Definitely it’s one of the best travel packages. Tamarindo hosts a huge part of the Las Baulas National Marine Park, part of the Tempisque Conservation Area, including Grande, Langosta and Ventanas beaches. Las Baulas is home to the largest nest of leatherback turtles in Costa Rica, and it is the most important nesting zone in the American Pacific for this endangered species. Even though the park is a protected zone, recreation is allowed, you can enjoy scuba diving and observe the rich underwater life. One of the most exciting Costa Rica ecotours is watching the egglaying of leatherback turtle! If you also want to check the nightlife in Tamarindo, you will find a ton of options to end an intense in this beautiful place: restaurants, clubs, discos and more.